Buying insurance used to be fairly straight forward. When I purchased insurance on the open market through ehealthinsurance.com in 2013 all I had to do was enter the ages of my family members, hit search and decide what plan I wanted. We then filled out an application form and presto, we had insurance. At the time we were paying around $60 per month per person for a high deductible health care plan. Now it isn’t so simple. To buy health insurance through the health care exchange you must fill out a form that asks prying questions about every aspect of your life. Rates for your health insurance are based more on your income than on your age and health status. And Heaven help you if you don’t have a typical nuclear family. My experience signing up on Obamacare was a nightmare. Mrs. C. took the brunt of it, but all in all the process was exhausting. With the open enrollment period opening last week I figured now would be a good time to share my experience. I knew that the rates for health plans would be based off of Adjusted Gross Income, so I wanted to ensure that ours was as low as possible. Mrs. C. and I contributed about 20% of our income between our IRAs and HSA in 2014. For a couple without a 401K available the most two IRAs and an HSA can give you in the way of deductions is $17,650. This can make a huge difference in the subsidies of plans. If it gets your income below 250% of the Federal Poverty Level you can also qualify for a cost-sharing silver plan in which the deductible is highly reduced. Our insurance company had been steadily increasing our rates and we wanted to be prepared to switch to Obamacare in 2015 if necessary. When we gained custody of our Nephews in April we decided to go ahead and apply for Obamacare. Gaining custody of them allowed us to qualify for a special enrollment period. With 6 people the cost of our current insurance was not a viable option anymore. I carefully answered all of the questions on the Obamacare application, which took me close to two hours to get through. The application allows you to give your earnings from last year or estimate this years earnings. Since we made more money this year I estimated ours for 2015. The automatic system was not designed to deal with blended families well. It asked many questions about custody and how people were related, but for whatever reason it didn’t work out right. When the application went through it had every single person in our household as a different family group and needed to get insurance separately. I had no desire to have 6 different health care plans and with us split up like this the total cost for even a bronze high deductible health care plan was over $500 per month. I looked into the financial guidelines for the subsidies some more and found out that since our Adjusted Gross Income was under 200% of the Federal Poverty Line the kids should all qualify for MiChild, the CHIPS program in Michigan. Essentially it is a type of medicaid where the cost is only $10 per family per month. Since our application did not state that we qualified Mrs. C went about contacting Obamacare over the phone to get us insurance. Mrs C. filled out an application over the phone using the cheat sheet I made for her with all of our earnings information. I can not imagine how difficult this process would be for someone who doesn’t have all their details figured out. Per the phone conversation they were able to tell us that our kids should qualify for MiChild and that our nephews should actually qualify for medicaid because our income isn’t supposed to be taken into account for them. Mrs. C. was then given options for us over the phone, but we were not able to see the different health care plans on line. She called back later and was able to talk to someone who put our application through correctly. Once this was done we could select our plan. For just Mrs. C. and I we selected a Bronze high deductible healthcare plan that costs $120 per month, which still allows us to have a family HSA plan. Previously we had been paying around $320 per month for our health insurance. Ideally the story would end here, but it doesn’t. When Obamacare refers your children to Medicaid it goes to the State DHS. They then review it and have a certain amount of time to approve or deny it. They take their time. The son Mrs. C. and I have together got denied medicaid quickly and then he was referred to MiChild, which then accepted him, as they should have. The rest of the kids health insurance became much more difficult. When Obamacare passed the CHIPS programs, which MiChild falls under, were supposed to switch the way people qualify over to being based off of your tax group to make things easier. MiChild had not fully switched over and that is where we ran into the problem with my step son. They were not including my income because I am not his parent, or adoptive parent. With just Mrs. C’s income and his biological fathers income he would qualify for medicaid. 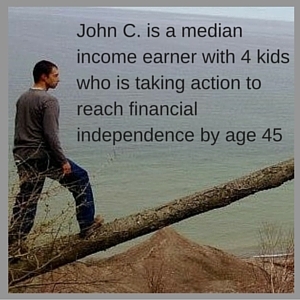 When sent to medicaid they would not approve it because of my income and he became trapped in a loop. Mrs. C. made dozens of phone calls to resolve this and spent hours upon hours on the phone trying to get this resolved. I’m sure we are not the only family with a step child, it baffled me how difficult it was for this to go through. While this was going on our nephews also were rejected by medicaid because they already had medicaid under their father’s case (who no longer had custody of them). Trying to explain this was also a problem and required multiple phone calls. This one was a bit easier to resolve on our end. It took about 2 months of effort to finally have everyone covered. By reducing our health care costs by $2,400 we are able to save more money, and thus more likely to be under the 200% line in the future for our kids to continue to qualify for MiChild. The kids can still go to their regular doctor which was the big fear we had with switching insurance. It is crazy how difficult it is to get health insurance and to figure out what your costs are going to be now. During the open enrollment period which started November 1 is the best time to compare costs to see if you can save any money. 2. Compare both AGIs to the Federal Poverty Level to see where you fall. It is best to be under 200% with kids and under 250% in general. 4. Consider getting a high deductible health care plan with an HSA. Even the cost sharing silver plans with a reduced deductible still qualify for an HSA, so you may be able to get an HSA AND still have a low deductible! Have you signed up for Health Insurance using the Healthcare.org website? What was your experience like? 4 Responses to "How We Navigated Obamacare and Saved Over $2,400 A Year"
Thanks for sharing that link back to my ACA article at Root of Good. I think we’ll be in a similar situation once we go on an ACA policy probably starting in 2016. Our 3 kids will get booted to the state medicaid/CHIP program. Ours is $50 per kid or $100 max per family per year I think. Our regular family doc is in network and so is our dentist, so we lucked out on this. I just hope our situation isn’t as complicated as yours! Our 3 kids are all biologically both of ours, so hopefully that will make it straight forward (just a half dozen phone calls, right? 🙂 ). Hopefully as time goes on the system will get easier to deal with, its only the 2nd year of the ACA law now it can only get easier right? Wow, that was a lot of effort but it sounds like it really paid off for you. Nicely done. Yeah it all worked out in the end. I’m so glad Mrs. C. dealt with the lions share of it. Inefficient bureaucrats drive me crazy. Hopefully renewing our policy will be much easier.